First, a quick trivia. All Champagne is sparkling wine, but not all sparkling wine is Champagne. Sounds confusing? Well, let me explain. 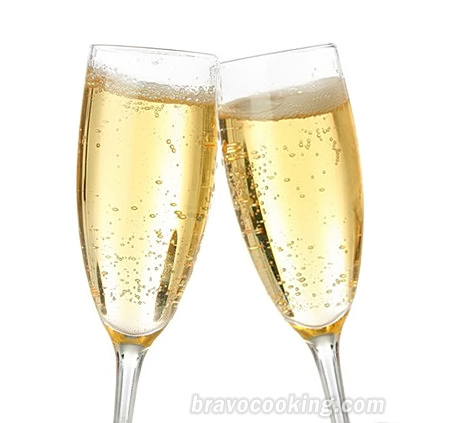 Champagne is a type of sparkling wine, and made specifically in the Champagne region, northeastern France. The same distinction applies to the popular Asti Spumante, which is also a sparkling wine, not a champagne, and made specifically in the Asti region, in Piedmont, Italy. What contributes to the confusion is the persistence of New World wine countries, from Australia to the US, to label their sparkling wine as champagne, in a move to create generic commercial association. This issue has been a long-running copyright dispute in which France, and the other members of the European Union want to bar non- Europeans from using names of wine producing regions that includes not only Champagne, but also Chablis, Burgundy, Port, etc. Since this dispute is far from resolve, the public, especially the non-Europeans, can still generically call sparkling wines as champagnes, and these labels will continue to come out of the leading non-European sparkling wine producers like the US, Australia and New Zealand. Methode Champenoise is a 17th century discovery of monk Dom Perignon (name of one of the most prestigious brand of Champagne, owned by Moët & Chandon). 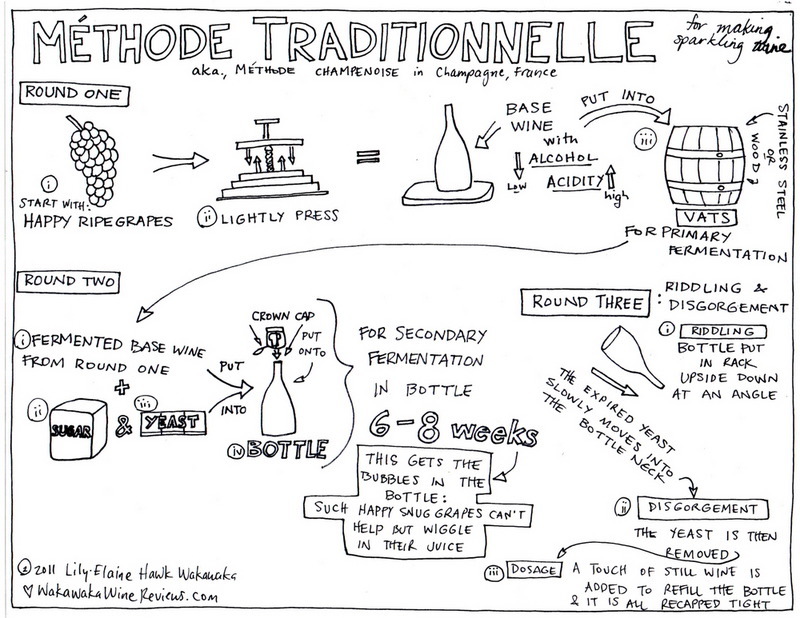 Methode Champenoise means ‘fermented in this bottle’. Simply put, after first fermentation that almost exclusively takes place in stainless steel tanks (to keep wines fruity with no oak traces), the second fermentation is done on the bottle. The carbon dioxide (CO2) that resulted from this fermentation has no where to go and is trapped in the bottle and integrated into the wine. The bottles are then placed in a level position, and gradually moved to an inverted position (known as riddling). This will take place for up to 20 weeks to allow the yeast deposit to settle in the crown. The bottles are then gently placed upside down in a shallow bath containing sub-freezing agent to freeze the liquid in the neck of the bottle containing the yeast deposits. The yeast deposits are then removed, and dosage added. Dosage is the replacement wine covering for the amount of fluid lost in the fermentation process. The finishing is finally completed with the wine being corked, wired, foiled, and probably stored in-house for additional 6 months before being shipped out for sales. Methode champenoise is the only legal methodology practiced in the Champagne region and the rest of France. The second methodology is known as the Charmat method, also called bulk method. The wine in first fermentation is transferred into large tanks complete with its live yeast(or tirage). After secondary fermentation of usually 4-5 days, the wine is drawn out, filtered and bottled under pressure with dosage. Sparkling wines made from the Charmat method are less expensive. The resultant bubbles (or effervescence) are also far coarser than the ‘champenoise’ method, as this process fail to extract maximum benefit of extended yeast contact. The third methodology is the Transfer method . It is quite similar to the ‘champenoise’ method, except less time consuming because of the elimination of the riddling process . The fermented wine is removed from its original bottle and pumped into large tanks, filtered to remove the yeast residue. Then, the wine is dosaged and rebottled (or transferred) under pressure into a new bottle. Quality is generally less than the ‘champenoise’ method, but this technique has shown great improvement over the last few years. The final methodology is the Carbonation method. It is the cheapest form of sparkling wine, as carbonation process, very much like doing cola or soda, is applied to create weak and coarser effervescence on the wines. The primary grape varietals used in sparkling wines are Chardonnay and Pinot Noir. Blended secondary grape varietals are Pinot Meunier and Pinot Blanc. Although, Riesling grapes are used in both Alsace (France) and Germany, with good quality result. Most sparkling wines are white (misnomer for light straw hue) or pink (blush), even if grape varietals like Pinot Noir and Pinot Meunier are both black (or red) grapes. This is done, when these grape varietals are pressed immediately after harvesting, to extract the white juice without much skin contact, known as Blanc de Noirs. If the sparkling wine is made from green grapes, it is known as Blanc de Blancs. Vintage years play a small part in determining quality of sparkling wines, unlike its influence on most table wines from Europe. The reason is that most sparkling wines are blended from multiple vintages of wines. In the Champagne region, only superior vintage years are declared on the label. Another important term to look for when checking sparkling wine labels is the term Cuvee Prestige or Tete du Cuvee. This is the absolute top-of-the-line sparkling wine. In Champagne, it means the best grapes from the best villages. In New World wine countries, it also means the best grape material produced by the winery. It seems academic to say, that prices of these Cuvee Prestige are at its highest also. As for sparkling wine taste styles, it may range from the sweet (or called Demi-Sec) with residual sugar of up to 5%, like the Asti’s, or the dry (absence of residual sugar) style of less than 0.5% of residual sugar, also known as Brut, that is characteristic of most Champagnes. 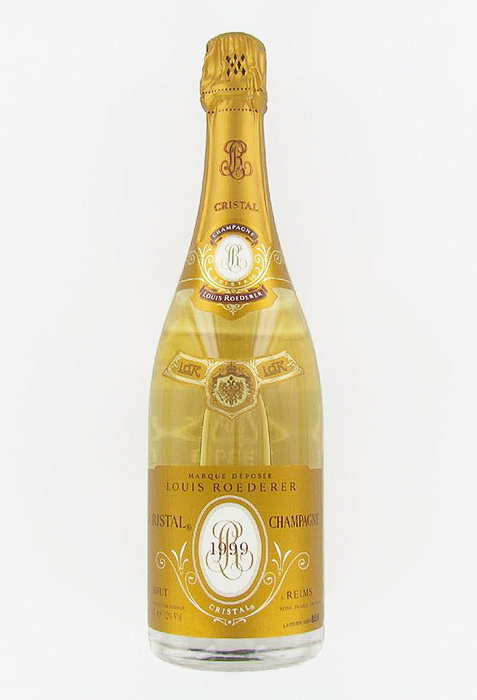 So the next time you think of celebrating with ‘bubbling’ effect, consider this: for the same cost, would you take a bottle of vintaged Cristal Champagne (from renowned Champagne house, Louis Roederer) or 5 cases of Andre Sparkling Wine (the top brand of sparkling wine in the world)? Take your pick?